AS FLY FISHERS, we are constantly inundated with marketing pomp disguised as newfangled gadgetry that will help us catch more fish. A rod made of materials fresh off the space shuttle, a drag designed in conjunction with Brembo and Team Ferrari, or a line that both defies gravity and the visible light spectrum (unless you’re wearing the matching sunglasses) — it is all pitched as the fast-track to fly-fishing success. I’ve got zero problem with gear manufacturers doing this, and I applaud each and every angler that buys into the latest and greatest. You likely purchased something you will have forever. That is, until you tear it up. And subsequently buy a more aesthetically pleasing replacement. When it comes to the landing net — a near-ubiquitous fly-fishing tool, I don’t often carry one. I find them clunky, difficult to manage when using a waist pack, and prone to alien abduction. Further, having owned several classic hand-constructed nets, I’ve wound up beating them into submission (i.e. wearing the finish off, watching them de-laminate, etc.) and then borrowing someone else’s when the need arose. 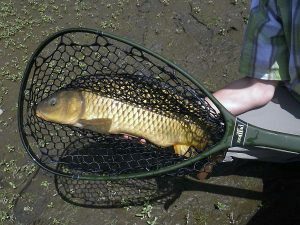 So when I first laid eyes on upstart Nomad Fly-Fishing’s Guide model net, fashioned with new age materials, the first thing that crossed my mind was fail. 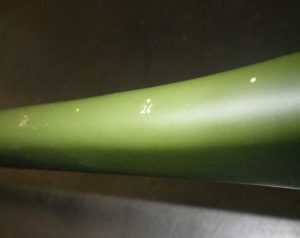 After the laugh, I picked it up, ran my hands across the rubberized finish, twirled it around like a baton (re: my marching band days), and tried bending the handle over my knee. Then I called the manufacturer to plead for a test model. As specifications go, the net measures 48″ from tip to tail. The basket is 18″ long by 13″ wide (at its widest point), and the basket is roughly 12 1/2 inches deep at its center (accounting for the sag in the 11″ diameter flat section molded into its bottom). It weighs just 16.8 ounces, basket included. That’s ounces, not pounds. Yep, it’s light, and it got that way via a fiberglass/carbon composite. Add the balanced feel and that’s one problem — clunkiness — solved. The net tucked down easily behind my pack, and stayed relatively out-of the way of my legs. But the really huge upside to the net is the fact that it floats on the surface of the water, and does not creep down over time. It’s perfect for any kind of boater, and was easy to manage from my float tube. Even better, the Nomad is very durable. The one I tested took a few rock bites when my “lady friend” attempted to land a trout for me, and it got kicked off the boat a few times too. But it shows nary a sign of abuse. And that’s after I had a go at it. I dragged the net around in two canyons, spending a decent amount of time netting fish while also using the Nomad as a walking stick. Since the manufacturer probably hopefully isn’t reading this, I’ll also admit I purposefully threw the net against rocks, jammed the basket under a few more while landing fish, and stomped on the handle with cleated boots. I couldn’t kill it either. When I wasn’t engaged in attempted “neticide,” the thing was stuffed behind my waist pack. Sure, the long handle is better suited for boat work, but the rubberized finish is dead serious in the no-slip department — while walking I simply pulled it up and it stayed put. I’ve showed the net to several guides, most of whom immediately suggested the basket needs to be expanded. But they agreed that for the average trout or bass the existing Nomad configuration would work just fine. I also pondered how a bigger basket would act on a float during heavier flows, but then realized I’m not a guide (and I don’t even own a boat). Heck…we landed carp in the darn thing, and those critters are all about the death match! Ok, so their tail was a little cramped — I’ve got little room to argue. But Kevin Best, proprietor of Nomad Fly-Fishing, told me he’s already working on a bigger basket to satisfy professional guide needs anyway. “I’m really sorry MG, but nothing is going to convince me to carry around an obvious boat net while wading.” Well you must feel lucky [punk], because you don’t have to. Nomad has another model — same basket, with an 8″ handle, and it weighs just 12.3 ounces. And if you still have mixed feelings, the company already has plans for a mid-length handle too. Personally, I don’t want to loose the finest touch on the Nomad — the measuring marks up to twenty-seven inches. If only to perpetuate the dream. I figure why have two nets (one for wading, one for boating) when I can make do with one? Which covers yet another issue: that I’m a cheapskate. Finally, an innovation I can really use. Editor’s note: Nomad Fly-Fishing’s Guide net is presently available from fine fly-fishing retailers in Colorado and Wyoming. And expanding quickly.